The smallest boat in the French Nautitech range of cruising catamarans, this model is intended to deliver an innovative, fast and fun experience. The boat has been designed to be easy to handle while also offering good accommodation space that’s arranged in a manner the builders hope will redefine the use of space in a cruising catamaran of this size. The spacious modern fit out is intended to be equally suitable for charter use or for long-distance voyaging, while a high bridgedeck clearance reduces slamming in big seas. The choice of accommodation layouts is centred around a three cabin owner’s version, or a four cabin design aimed at the charter market. There’s also the option of further small single cabins in the bows that would be suitable for occasional use by children or crew. 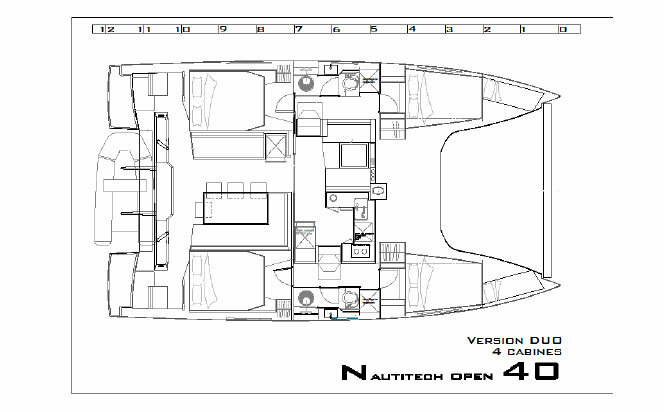 Both layout versions share the same well-equipped bridgedeck galley, plus small sitting/dining area. 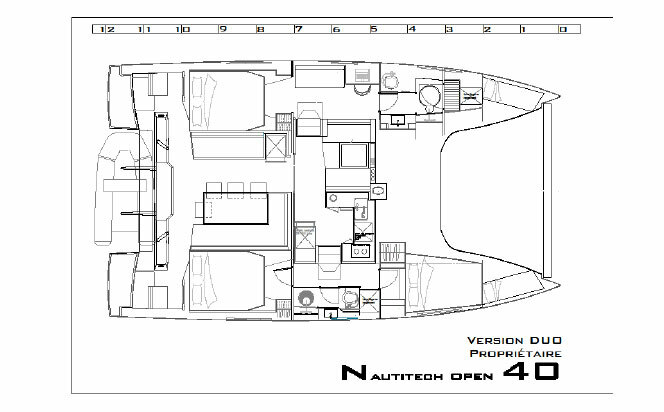 However the main living and dining areas are outside under the hardtop, which means they are much more generously sized than with conventional multihulls of this size. A further advantage for boats used predominately in warmer climes is that guests will be able to spend more time outside, where they may be cooled by the breeze, but with the benefit of being shaded from the sun. If necessary, this area can be screened off to keep wind and rain at bay. Fine hulls, a generous sail area, including a fashionable fat-headed mainsail, combined with lightweight construction enables the boat to perform well in light airs. ‘There’s an emphasis on ease of sailing, with fixed keels and a simple deck layout, keeping it light,’ says designer Marc Lombard.